What could have been history's first "green" construction project? That honor probably goes to 605 B.C. 's Hanging Gardens Of Babylon. While no physical evidence has ever been found of this construction/engineering/environmental marvel, legend puts it within the boundaries of Mesopotamia, or present day Iraq. It was supposedly built by King Nebuchadnezzar II to cheer up a homesick wife who missed the rolling green hills of her homeland. "Eyewitness" accounts claimed the gardens reached 75 feet in height, featured potted plants and gardens on terraced levels, and were irrigated by a clever if primitive system of levers, pulleys, and waterwheels. Ancient historians proclaimed the gardens one of the "Seven Wonders Of The World", a title it still holds to this day. Unfortunately, as we progressed through history, developers were hard pressed to equal the construction and environmental triumphs of the Hanging Gardens. Indeed, critics pointed out (not always unfairly) that new construction often meant the loss of natural landscapes. But construction history wrote itself a new page beginning at the end of the 20th century. Structures are now being built or retro-fitted to be more environmentally sustainable. And designers and builders are coming up with clever ways to have water heat buildings, sunlight provide power, and backyards act as gutters. And a good example of green construction in the tradition of the Hanging Gardens is the work of Italian architect Stefano Boeri. Boeri likes to incorporate living vegetation into his building projects for the environmental (clean air, noise and pollution) filters that they provide. 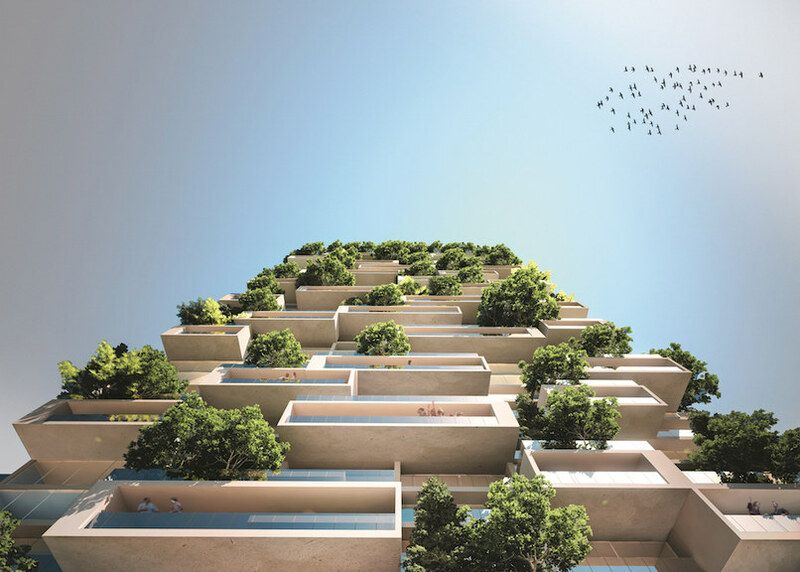 He has already designed two literally "green" apartment buildings which are now standing in Milan, Italy. Trees and other vegetation inhabit terraces and other outdoor areas of these buildings. And Boeri's most ambitious tree tower is yet to come. This upcoming project is named La Tour des Cedres or Tower of Cedars, and will be a 36 story apartment tower located in Lausanne, Switzerland. This will be the first building in the world with an exterior hosting huge amounts of vegetation. In addition to cedars, the plan calls for the building to have 6,000 shrubs, 18,000 plants, and be located on a 3,000 meter green campus. Photos of the upcoming Stefano Boeri Architect's project can be seen by going to: http://www.details.com/story/stefano-boeri-tower-of-cedars-high-rise.